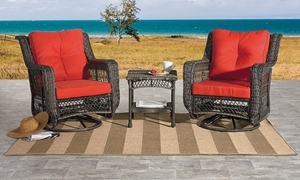 Two swivel glider chairs in hand-woven all-weather wicker with fiery red outdoor-grade cushions. Includes 18-inch side table. 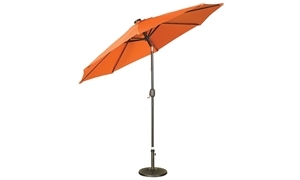 Overhanging umbrella is great for day or night with its 10-foot wide canopy and solar powered LED tube lighting. 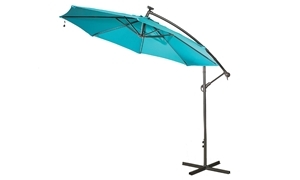 Umbrella with 9-foot canopy features an easy to use crank lift and steel ribs equipped with solar powered LED bulbs. 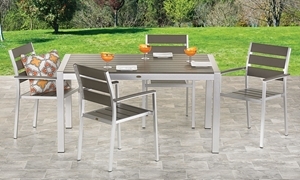 60-inch brushed aluminum table and four armchairs featuring specially crafted planks to withstand the elements outdoors.